Above: Nick Counter of the AMPTP declares that "Greed is good." The AMPTP producers and studio executives have pretty much forced the WGA to strike as soon as Friday, because of AMPTP's insulting and childish refusal to discuss with the writers any plan to address any fair residual compensation for digital downloads. The WGA will announce their decision Thursday, at 7:00 p.m. at the L.A. Convention Center, and all signs point to a strike being officially called. The California Browncoats are auctioning off a cast-signed copy of the script for the BSG ep “Crossroads Part 2.” Proceeds will support the St. Jude Children’s Research Hospital. The auction ends November 10th. SyFy Portal found TV Guide’s mention of a new version of “The Story So Far” being created to catch viewers up with Seasons 1-3 of the show. Apparently it will air next spring leading up to the S4 premiere. More bits of the Jamie Bamber interview call have popped up on SciFi Wire (no spoilers) and UGO (mild S4 spoilers). David Eick talked to World Screen this week about his work on both BATTLESTAR GALACTICA and BIONIC WOMAN. Lucy Lawless gave one of her usual delightful, silly, mysterious interviews with iF Magazine. No spoilers here, just giggles and an update on the BSG eps she’s shooting for S4, as well as her music career. Edward James Olmos, Ridley Scott and Darryl Hannah sat down with CNN for an interview about BLADE RUNNER. 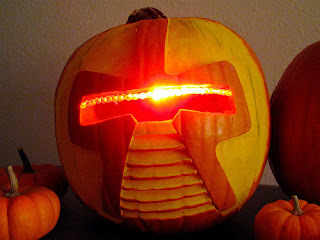 Watching BSG just turned me on to some great links on how to carve a Cylon Jack-O-Lantern. Because it’s never too late to make more yummy roasted pumpkin seeds and more pumpkin pies. Also thanks to this site, I now know where to get a viper pilot costume. Sweet. As one of our readers noticed, SOUTH PARK recently tipped their hat to BSG. This episode, “Imaginationland II,” is being rebroadcast tonight along with parts I & III. 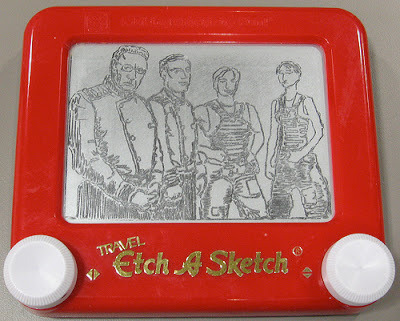 We all know how much Stone & Parker love them some BSG. Tricia chatted with James T. Kirk and Denny Crane at the Spike TV Scream Awards. Michael Trucco (Samuel T. Anders) talks Turkey. I think what baffles me a little is the reluctance (a kind word) of the studios to even entertain formulas for sharing the wealth on the internet, i-tunes, downloads, webisodes, mobisodes and whatever-a-sodes. It's not like the WGA's demanding advance payments on money that hasn't been collected yet via these new distribution systems. We just want a (small) piece of whatever DOES come in. And yet somehow this is all too complicated, possibly requiring a three year study (gee, what a coincidence, three years until the next contract negotiations!) to figure out just how much money the networks are making from the new technologies that they can't share because it's all too heady... or something. 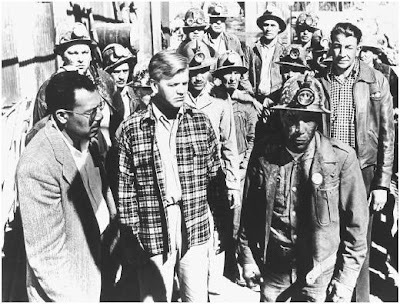 That said, it remains to be reiterated that the last thing ANY working writer wants is a strike. This is a tough, time sensitive, mercurial business, and work stoppages can have ramifications beyond the checkbook. And writers, especially in television, are not blind to the downside of what happens when shows go out of production. Besides the damage done to the production staff, when the shows stop coming it's possible audience eyeballs will go with them. So I'm still crossing my fingers that wisdom trumps... something... and next week finds us all busy at our keyboards. And Mark reports that he intends to attend the Ventura, California Razor screening. Video with spoilers up through the end of season 3. Some people are reporting that the confirmation emails for the BSG: Razor theatre screening are ending up accidentally deleted since the mail has ended up in their spam filtering nets. So, if you're signing up for the event, be sure to check your spam box as you'll need the confirmation email to gain admission. Thanks to reader Aragorn Marsden for the info. Here is more from the recent Jamie Bamber conference call interviews, on TV with MeeVee. Katee Sackhoff spoke recently to the Williamette Week in her home state of Oregon. Hmm, Lindsay Wagner is also from around Portland. The DVD cover art for WHITE NOISE 2, starring Katee Sackhoff and Nathan Fillion, has been revealed via DVD Active…but still no actual street date for the US disk. Ronald D. Moore, 43, has created fanatical followers for the Sci Fi Channel by using the Internet to let fans see the inner workings of his show, Battlestar Galactica. Podcasts go inside the writers' room, and Webisodes have doubled SciFi.com's traffic. "From the beginning, I wanted a very open policy: Let's put as much on the Internet as we can--concept art, scripts, outtakes. We took a three-day writers' retreat to Lake Tahoe to break the second half of the season; we talked about all the stories, and I recorded all that. It will go up online at the appropriate time. Let people see how we make the sausage. But they have to be prepared to realize that we're making a lot of stuff up on the fly, that we make mistakes. I'd be perfectly happy letting fans digitally download everything in the production office, right up to and including putting dailies on the Internet. Then they could edit their own versions of the show. That's what I would want if I were a big fan." Deadline Hollywood is keeping up to date on all the latest WGA contract issues and strike news. Galactica.TV has an excellent interview with Gary Hutzel, special effects supervisor on Battlestar Galactica, and they talked to him about FX on Razor and how they created the look of the original style 1979 Cylon Centurions and Raiders. 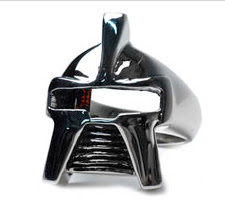 Galactica TV landed a bunch of exclusive Razor images of the old school toasters in action. Deadline Hollywood and Maureen Ryan in the Chicago Tribune detail the ongoing WGA/AMPTP talks, that don't appear to be making much progress at this point. It's hard to believe that an agreement, let alone signs of progress toward an agreement, will be achieved by the November 1st deadline. UPDATE: See also the latest from Mark Evanier. "I've thought about directing for a long time, and this season seemed like the time to finally take the plunge," Moore said in a statement. "It'll be great to be working with the BSG family of cast and crew for my first experience behind the camera, and I'm really looking forward to it." Bamber has played Lee Adama since the 2003 miniseries that began the series. He said that he is sad about the show's imminent demise but is excited about moving on to the next phase of his career. "There's always nostalgia," Bamber said. "It's been an amazing learning process for me, personally and this experience is without doubt the most interesting and rich one I've had as a professional working actor. I have learned everything from everyone around me. So it will be very sad to sort of disband the team, and every day that we're up here in Vancouver there is an element of nostalgia about moments passing and little scenes that will never be revisited and sets maybe that disappear, because, you know, they're gone forever." Jason Cahill (The Sopranos) is coming on board NBC's Bionic Woman as show runner, according to The Hollywood Reporter. He steps in for Jason Katims (Roswell), who has been pulling double duty running Bionic and Friday Night Lights since joining the former as a consultant in early September, the trade paper reported. Watching BSG: Battlestar Galactica’s Tricia Helfer and Jamie Bamber hit the red carpet this past weekend, making an appearance at the Spike TV Scream Awards. 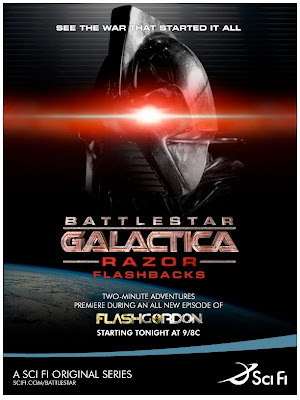 The reservation site for Battlestar Galactica: Razor screenings is now online. And if you're so inclined, you could also let them know that they should tell the AMPTP (Alliance of Motion Picture & Television Producers) to quit being so corrupt and criminal and to cut a deal with the WGAW to avoid a protracted strike. Denise Martin of the L.A. Times Show Tracker blog, reports that the Sci-Fi Channel has decided to debut season 4 of Battlestar Galactica in April of 2008. ...Now excuse me because I'm late for my session of scream therapy. P.S. I guess this explains why Universal isn't planning to release season 3 on DVD until April. Steve West of Cinema Blend has a mostly spoiler free review of Battlestar Galactica: Razor, giving the movie 4.5 stars. “Razor” has much in common with the mini-series that started this whole show off a few years ago, and there’s an element of seeing the same thing from a whole new perspective during the flashback scenes.... “Razor” begins slowly, but soon builds up and pounds you with nearly non-stop action and excitement for a solid hour. Aside from last season’s premiere, this is the largest cavalcade of battles we’ve seen in BSG for a long while. It’s a welcome change for those who felt the mid-end of season 3 plodded along just a bit too much. Have no fear, there is a lot of action in “Razor,” and it will hold you until the very end. Ronald Moore and the crew working on the show have not lost their touch with brilliant storytelling weaved into a battle heavy showpiece. In fact, you could say that the writer and director of “Razor” found the magic that still leaves season one as the best in the shows history. Read West's full review here. Following up on Battlestar Galactica: Zarek, which told of Tom Zarek’s early days, Dynamite will delve into the history of Gaius Baltar in November in the opening arc of Battlestar Galactica: Origins. And the writer – Kevin Fahey? A new name to comics fans to be sure, but not to those who watch BSG credits in detail. “Mark [Verheiden] sent Kevin our way and he’s proven to be an invaluable resource as from the time we started talking,” Rybandt said. “He’s a staff writer on the show, and he now has a direct connection to the future of the show and the stories they are planning. For more comments from the creators of this comic visit here for the full article. "The WGAW continues to be committed to organizing reality." The Deadline Hollywood column by Nikki Finke of the L.A. Weekly seems to be the best place for news and information on all the WGA/AMPTP contract negotiations if you want to keep up to date on all of that. If you’re on pins and needles waiting for the Nov. 24 debut of the Sci Fi Channel movie “Battlestar Galactica: Razor,” help is at hand. You may only have to wait until Nov. 12. There will be free screenings of the film in movie theaters in eight cities on Nov. 12: Los Angeles, New York/New Jersey, San Francisco, Dallas, Boston, Philadelphia, Seattle and, yes, Chicago. The screenings will take place at multiple locations in each city, but all of the screenings will be on the evening of Nov. 12. ...Admission is free, but those who want to see “Razor” at a movie theater must first register at the site battlestarevent.com. The site will not go live until Friday. Repeat: The site will not go live until Friday. Seat registrations will be given away first-come, first-serve. For more details see the rest of the Ryan article. Ryan also gives her first impression of Razor and notes that she will soon have a Q&A with Razor's writer Michael Taylor. You can leave questions for him at the end of Ryan's post here. Livejournalists Bamber News and dryope found tons of photos of Jamie Bamber and Tricia Helfer at the Scream Awards this weekend, as well as this black-carpet (heh heh) interview with Bamber from Dread Central. Go to 2:40 into the video to see his bit (youtube mirror link here). Meanwhile we the unwashed masses can watch the taped broadcast of the Scream Awards tomorrow night on Spike TV. Jennifer Godwin posted a brief run down of "Ten things to know about Razor" on E Online's Watch with Kristin blog. No major spoilers, just a list of brief bullet points worth checking out. Co-exec producer of BSG, Mark Verheiden has some of the latest info on the potential WGA strike on his blog. Keep an eye out for Sam Witwer (Crashdown) in this trailer for "The Mist"
As I suspected, there is still no firm date for the start of Season 4 next year. SyFyPortal got the skinny from a SciFi Channel rep: it is not, as many fans have been fantasizing, January 2008. “Early 2008” is the best SciFi has to offer right now. Please don’t let it be April! 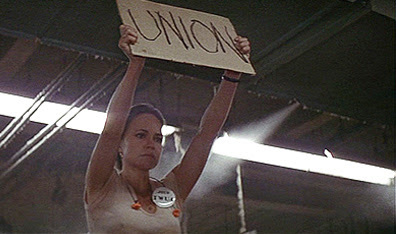 Meanwhile, Terry Moore (“MrsRon”) shares updated news about the potential WGA strike over on the skiffy forum. Apparently the WGA is asking writer/showrunners to cease ALL duties, not just writing – which means many shows would shut down completely during a strike, even those in production on completed scripts. UPDATE: See the New York Times and L.A. Times for the latest news on the outcome of the WGA's strike authorization vote. In the same conversation through his wife, Moore also revealed that he has only just recently completed Episode 13 of the last season, which means he still has six episodes to write before writers walk out on Nov. 1 as part of an imminent writers strike. It's unclear how Moore is covered under WGA rules in case of a strike, and if his position as an executive producer affects his ability to continue writing even during a walkout. It had been believed that writing was nearly complete so that "Battlestar Galactica's" shooting schedule would remain uninterrupted in case of a prolonged writers strike. With this news, however, it seems almost impossible -- unless the strike is short-lived -- that the final season would not be split with one half in 2008 and the other half in 2009. This would suggest that SciFi Channel's chatter about splitting the season is actually based on production issues, not entirely over SciFi Channel trying to expand the shelf life of the series. Nicki Cylne (Cally Henderson Tyrol) was recently at the Sydney Supanova 07 convention in Australia. 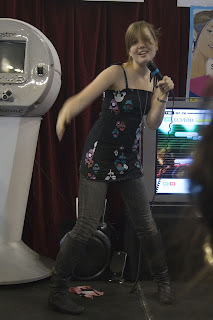 LiveJournal user lapzod has some great Flickr photos of Nicki singing with Nicholas Brendon - "Xander Harris" in "Buffy the Vampire Slayer" at Sony's Singstar booth. See part of Nicki's convention talk here and another song with Nicholas Brendon here. Well how did I miss this!?! Darn it. 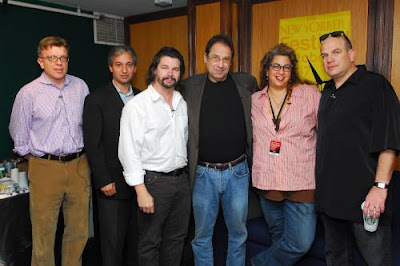 The New Yorker Festival recently hosted a panel discussion called “Outside the Box: Television Masterminds” that included Ron Moore, David Milch (DEADWOOD/NYPD BLUE) and Jenji Kohan (WEEDS). EmDashes has more details (and a tad too much Milch-hating for my taste, but whatever), and here's a bit more from The New Yorker’s Vulture columnist. Season 3 DVDs in April? TVShowsOnDVD.com pointed us to this post on the Digital Bits Rumor Mill blog - according to "an insider" from Universal Home Video, the USA release of Season 3 DVDs is "penciled in" for April 2008. OK...*sigh*...it’s only on the cover of the new GEEK MONTHLY magazine. But still! SPIKE TV is taping the 2007 Scream Awards this Friday night in Los Angeles, at the Greek Theater in Hollywood. They have announced appearances will include Christian Bale, Jamie Bamber, Kristen Bell, Jessica Biel, Tim Burton, Bruce Campbell, Rosario Dawson, Ralph Fiennes, Harrison Ford, Megan Fox, Sid Haig, Paris Hilton, Tricia Helfer, Jennifer Love Hewitt, Jesse James, Amy Lee, James Kyson Lee, Tommy Lee, Kristanna Loken, Zachary Quinto, Keith Richards, Freddy Rodriguez, Robert Rodriguez, Seth Rogen, Eli Roth, Quentin Tarantino, Danny Trejo, Milo Ventimiglia, Michael Weston, Ray Winstone and more. Color me impressed. BATTLESTAR GALACTICA is nominated for three Scream Awards this year: Best TV Show, The Ultimate Scream, and Katee Sackhoff for Sci-Fi Siren. Go vote for the Awards here, you have until Friday October 19 at 2pm EST. Get over there! The Awards will be broadcast on Spike TV, Tuesday October 23 at 10PM ET/PT. 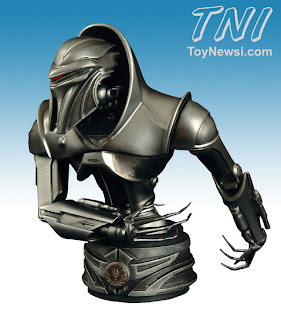 Very cool new BSG merchandise this fall includes Diamond Select’s scary Cylon Centurion bust, and BSG dogtags by Quantum Mechanix that you can personalize with up to 20-character names. A new book on philosophy and BSG is coming out this spring from Open Court Books. THE LAST SENTINEL, co-starring Katee Sackhoff, is coming out on DVD November 13th. [Sackhoff] says if she has her way, her wild and fierce character, Starbuck, will go out in a blaze of glory in the final season of "Battlestar." "I keep telling them, 'Kill me again,'" says Sackhoff, whose character apparently died at the end of last season but will be mysteriously back when the Peabody Award-winning drama returns mid-season for its own swan song. The actress earned a Saturn Award for her portrayal of the intense, worlds-weary fighter pilot, Kara "Starbuck" Thrace, on "BG." After all these years of playing her, Sackhoff feels adamantly that her character just wouldn't fit with a happy ending. "That's just who she is. She's happy and comfortable with her sadness. She's had such a hard life, whenever she is happy it doesn't feel good to her. And she's so scared she's going to lose it she pushes it away before it can go anywhere. It's sad, but at least she knows who she is." Sackhoff says she's let her wishes be known to "Battlestar Galactica" executive producer David Eick. "In the last episode, I want them to have me sacrifice myself for everyone, because the only way this woman would be happy is if she was gone when there was nothing else to fight for. That's the only thing that would have this woman be at peace." 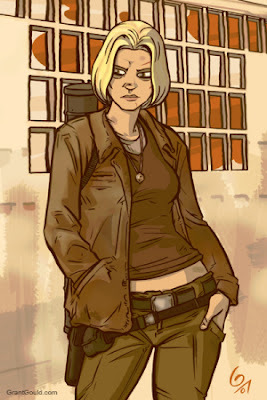 Artist & Livejournalist Grant Gould (gdg) has just shared his nice collection of Starbuck art. The rest of Grant's art is also posted at this site - including his viper pilot pinup cards. BSG game on X-Box Live and PC. TV Squad has posted a mini-review (spoilery) of RAZOR, which they also received in the mail this week, and pronounce the film "frakking unbelievably good"...there's an excellent fight scene screencap in there too. 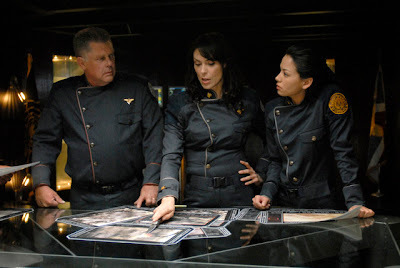 Battlestar Galactica: Razor is essentially here to tide us over until Galactica really returns with new episodes, but in that regard, it doesn't just play as filler and is an especially impressive piece of work. Bamber News has posted scans of Jamie Bamber's written intro to the recently released Battlestar Galactica: Official Companion Season Three. Michelle Alexandria in Eclipse Magazine has an early review of Razor that includes two significant plot spoilers. Read it at your own risk. The bottom line is, she liked it, calling it "amazing" and gave it a "Final Grade: A"
After a hard day’s teaching, a guy’s gotta flake out a little. So I watched Bionic Woman last night — and found myself thinking about, yes, privatization. I’m pretty sure the original, 1970s Bionic Woman worked for a government agency. But this version works for a private contractor - she even gets assigned to protect the daughter of a tycoon who gives the company a lot of business. Yet this private company seems to be empowered to go around killing people. And nobody seems to consider this at all unusual, or legally dubious. I guess TV writers just pick up on the Zeitgeist. Nicki Clyne will be at the Supanova Con in Sydney, Australia, this weekend. If anyone goes or talks to someone who attends, let us know? We'd all like to hear about it. ETA: Warning, that Supanova link has spoilers in it, according to a friend. Also, Kate Vernon will NOT be at Supanova (Nicki is replacing her). Several people have pointed me to this not-so-new but mindblowing essay. Since few under 30 and virtually no one under 18 is watching scheduled television per se, forward-thinking nets are making their key shows available on as many platforms and under as many different price models as they can dream up. "Digital is not yet the tail that wags the dog, but it's sure making the dog bark," is how one network exec described it. He also said it will become clearer over the next six to nine months just how big a stream these new ancillaries have become, if for no other reason because the labor talks will demand it. Every network has a different tilt -- price points, exclusivities, ad avails, revenue splits -- when it comes to putting their shows online. But all of them are starting to see the pennies add up. Several hundred million dollars in 2008 at each of the networks, this exec hazarded. The Nielsen Company is the largest and most important provider of TV ratings and entertainment marketing research in the USA. They have opened a web site (still in beta) where you can rate TV shows, films, music, and more. You know what to do folks! 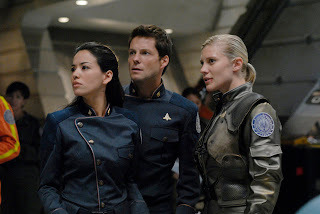 Git yer BSG-lovin’ butts over there, sign in and rate the show. While you’re at it, remember to do Katee and David a solid if you are enjoying BIONIC WOMAN. This is an unheard-of chance to speak directly to the TV ratings makers. 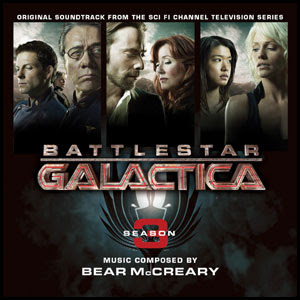 SoundtrackNet is giving a "first listen" to all the tracks off of Bear McCreary's Season 3 soundtrack album, which hits the shops October 23. These are partial tracks, but they sound great. Can't wait. In terms of what a November strike would mean for BATTLESTAR GALACTICA, well, I'm not exactly sure, except there would be nobody writing scripts if a strike is called, and there are still several episodes left to be written. I'm hoping that the waters calm and a deal can be made, of course, but if there is a strike, then a lot depends on just how long it goes. Mark also points to the blog of writer Mark Evanier where you can get more information on the possible strike. Some non spoilerly specifics - Katee asked everyone to give Bionic Woman a chance. She said the show is still finding it's legs and suffers from the input of 9453957 people at NBC. She also admitted that they had to tame Sarah Corvis a bit because she was overshadowing Jaime Summers. For our friends across the globe jonesing to see the first Flashback, these two alternatives to SciFi Pulse may work for you. You can view the first Razor Flashback with young Lt. William Adama here, at Sci-Fi.com. Also Bear McCreay has announced that he will be doing a pre-release signing of the Season 3 soundtrack CD at Dark Delicacies book store in Burbank, California, Tuesday October 9th. Even if you can't be there in person, you can order the signed CDs from the bookstore. Frakking Hiatus of Doom Part 1 is officially over. Hallelujah! Promotions for the DVD of BLADE RUNNER: THE FINAL CUT have begun in earnest, leading up to the December release. This new cut just screened at the New York Film Festival last week, and opens in theaters TODAY, for a limited time only in New York and Los Angeles. Here in NYC, if you’ve never seen a film at The Ziegfeld Theater…well, you just haven’t lived, man. Seriously. Check out recent interviews with director Ridley Scott in The New York Times and Wired Magazine…and Wired’s “nexus” of the many ways this groundbreaking film has influenced culture since it was first released in 1982. ...Given how well recieved Sackhoff was in the role of Sarah (the actress is now a recurring guest star), the producers set about finding a way to have these two become a little friendlier. Read Ryan's full update here. From the Fast Nationals for last night, Zap2It is reporting that BIONIC WOMAN’s ratings went down a bit (much like those of HEROES this week), PRIVATE PRACTICE’s went up…and CRIMINAL MINDS came up from last week’s 3rd place finish to beat them both. That’s genre TV for ya, folks. It’s our niche, deal with it. There's been a lot of speculation that the Writers Guild of America will go on strike in the spring of 2008 along with the Screen Actors Guild. But, Michael Ausiello reports that the WGA sent out Strike Authorization ballots, to begin a strike on November 1st when the current contract ends. Writer and producer J. Michael Straczynski confirms that the authorization vote is in progress and he points to this page with a detailed summary from the WGA that explains why there will be a strike. The short answer is because the studios are run by the criminally corrupt and greedy who not only don't want to pay writers fairly, but in fact want to roll back "every fundamental protection writers have won in the last 50 years." How will this affect Battlestar Galactica? Unknown. But, the expectation is that all the scripts for the season will be finished by November first. Certainly all writing will stop as of November 1, finished or not. 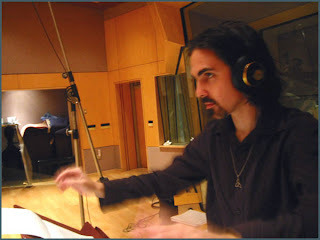 We'll be having a Q&A interview with Bear McCreary soon, to coincide with the release of the season 3 soundtrack late this month. If you have any questions for Bear leave them here as comments to this post, or email questions to me at logan[DOT]gawain[at]gmail[dot]com.